This is much more of an idea or a nudge towards making something that tastes wonderful and is easily put together rather than an actual recipe. I saw this years ago…it could have been Giada who made this however, I’m not really sure. I’ve been making it so long, it just seems like it was my idea, even though I know it wasn’t. I think as cooks we are always searching for the next best recipe and tend to overlook simplicity. I am amazed how these three ingredients make up one of my favorite breakfasts. The result is this creamy, sweet bread that melts in your mouth. Every time I serve this, people are amazed at how yummy a combination this turns out to be. It just hits the spot, either served alone or accompanied by other breakfast items. It is also great on a brunch buffet and will have your friends and family asking for seconds…make sure you have enough bread and pears on hand. This easily turns a dull weekday breakfast into weekend status. Give it a try, you won’t be disappointed. If you have never tried mascarpone, this is your chance to finally indulge. 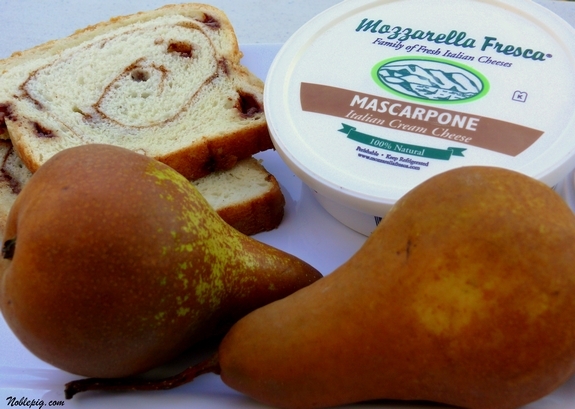 This is all you need: Cinnamon swirl bread, Bosc pears and a tub of mascarpone cheese. Toast your bread to desired level of crispness and schmear on the mascarpone. Top with thinly sliced Bosc pear. If you are serving this on a brunch buffet and are concerned with the pears browning, dip the slices in pineapple juice and remove quickly. This does look delicious and simple…not being a breakfast person I could easily eat this for lunch. I have to ask again, how in the world do you stay so tiny? Must be all that vineyard prep work! Just three ingredients between me and happiness?! Love it! Sometimes simplicity is just what we need Cathy.Thinly sliced, juicy peast with mascarpone….. This sold me as soon as I saw the 3 ingredeints…I love all of it. I’m fairly certain Grumpy would love this too! Thanks for this one! I just happen to have bought some marscapone cheese and did not know what I was going to do with it. I have never bought it before, and this will be a good way to get the best out of it! I hope I can get some really good pears at our grocery or produce barn. It looks like a breakfast my husband would like too. hmmm…that looks a whole lot better than funyuns! Good choice! This is so simple, but looks absolutely delicious. Love these quick and easy recipes. 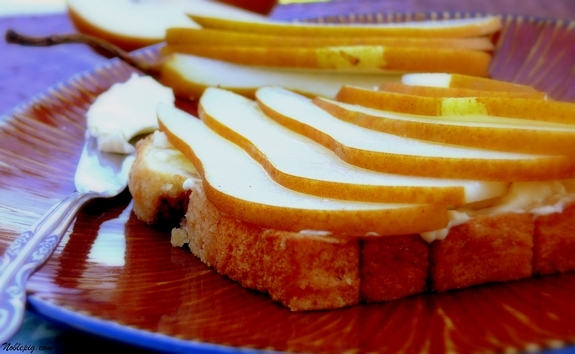 Fruit and cheese are the perfect pairing, but with the cinnamon toast, yummy! I just drooled on my keyboard. Seriously. Sounds pretty amazing to me. I love cinnamon bread and mascarpone. Why wouldn’t they be great together? Reminds me of a very delicious sandwich I had in San Francisco. I love a simple, perfect mix like this. The pears look so great on top! This is the perfect breakfast, I love the idea! Simple and awesome. Love it. Well, since I also live in Oregon, I’ll do anything with a pear! You are the second person I’ve seen lately putting mascarpone on a pancake-like breakfast food. I think I just might die from the decadence, and then go buy another tub of the good stuff and do it myself! Your photography never fails to impress me. Man, I’m loving that luscious, yet fresh sandwich…I’ve not tried mascarpone yet, which is quite a horror considering that I say I’m an avid cheese-lover! Simple foods make the best recipes – this looks wonderful. So simple and I just know it tastes terrific! I see Giada use marscipone cheese all the time, yet I have never tried it. Your easy breakfast sure does look fancy! I love it Cathy! I have to put that one on the list! Yum! I had these three ingredients within reach this weekend but never thought to put them together. What a great idea. That sounds so delish any time of the day! Wow Wow Cathy! Major yumsville! Believe it or not, as much as I love cheeses, I’ve never had Mascarpone cheese. This looks delicious! I LOVE cinnamon swirl bread and pears so I’ll have to look for the cheese. Looks like a perfect breakfast to me. Oh man this is a great combo with the sweet Mascarpone, wow! Wow – this looks so good! I want to eat it now!!! This looks amazingly simple and so yummy! 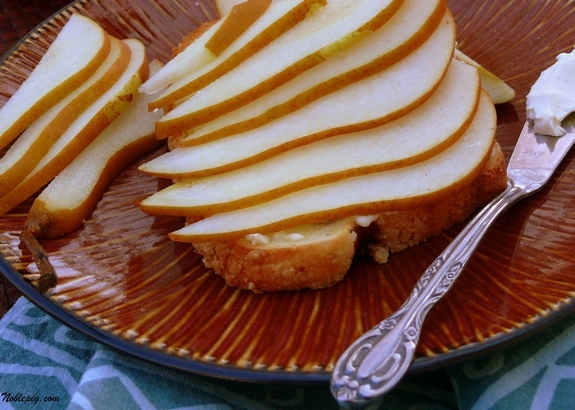 One question though…how did you get the pears so beautifully thin sliced? A mandolin? I’ve never tried mascarpone…looks like a really yummy combo! Having this for breakfast in the morning! Never left a comment for you before BUT I just made a slight variation of this …. 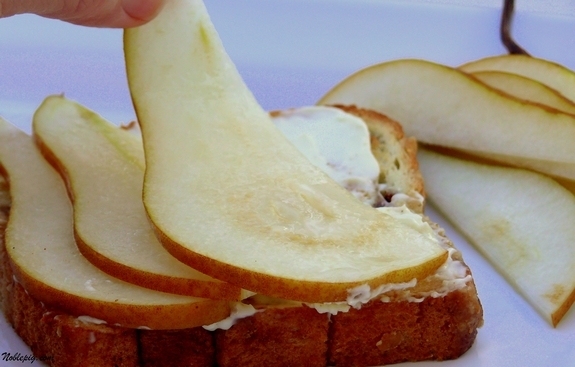 toast spread with mascarpone, sprinkled with cinnamon sugar and topped with very ripe sliced pears—awesome! thank you, it was a great lunch!